Electricity is a form of energy that starts with atoms. Atoms are too small to see, but they make up everything around us. All atoms are composed of subatomic particles, among which are the charged particles known as electrons and protons. 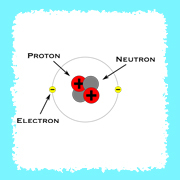 Protons, which are found in the nucleus of an atom, carry a positive charge (+). Electrons, which spin around the center of an atom, carry a negative charge (-). Neutrons also exist in the nucleus of a typical atom and are uncharged. Electricity is a form of energy that is associated with the buildup and movement of electrons and protons. Electricity can be created by forcing electrons to flow from atom to atom. The force or push of electricity is measured in volts. Electrical systems of most homes and offices have 120 volts. Most electricity in the U.S. is generated using coal, oil, natural gas, nuclear energy, or hydropower. Some production is done with alternative fuels like geothermal energy, wind power, biomass, solar energy, or fuel cells. A majority of the electricity is produced at power plants with the use of steam turbines. Mechanical energy is changed into electrical energy by using various energy sources such as coal, natural gas, and oil. These fuels heat water in a boiler to produce steam. The steam, under tremendous pressure, is used to turn a series of blades mounted on a shaft turbine. The force of the steam rotates a shaft that is connected to a generator. The spinning turbine shafts turn electromagnets that are surrounded by heavy coils of copper wire inside generators. This creates a magnetic field, which causes the electrons in the copper wire to move from atom to atom, creating electricity. The voltage produced by a generator depends upon the number of turns in its coils, the strength of the magnet, and the rate at which the magnet turns. 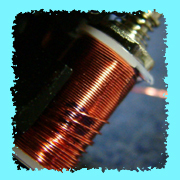 The more turns in the coils, the more voltage is produced. Power plants do not store electricity, so it is constantly being made and then distributed. Utility companies have to anticipate demand for electricity and distribute it to consumers. Electricity can be distributed most efficiently at very high voltage. Transformers are used to “step up” or “step down” the voltage along the system of power lines that carry electricity to consumers. First, the voltage of the electricity produced by a generator in the power plant is “stepped up” when it travels through a secondary coil of a transformer that has far more turns of wire than the primary coil. Each charge that passes through that coil then has more energy than the charges in the primary coil. The current therefore has an enormous voltage when it leaves the secondary coil and then travels through the system of cables and wires from the power plant into the transmission grid. These transmission lines carry the electricity across long distances to substations. A substation has transformers that “step down” the high-voltage electricity into lower voltage electricity. At a substation, the current passes through a transformer with a secondary coil that has fewer turns of wire, which reduces it to only a medium-high voltage. From the substation, distribution lines carry the electricity to other transformers on utility poles or on the ground that reduce the voltage so it can be used in homes, offices, stores, and factories. A cable then carries the electricity from the distribution wires to the house through a meter box. The meter measures how much electricity the people in the house use. From the meter box, wires run through the walls to outlets and lights. The electricity is always waiting in the wires to be used. The amount of electricity in the lines must be kept at a constant electrical pressure to provide enough power for the appliances and equipment that will use it. A second set of wires carries the current back to the generator in the power plant. These return wires are necessary because electric current must travel in a loop, or a closed circuit.